In August 2017 we noted Russia's largest private lender was in trouble and required a bailout. Then a month later, a second bank hit the wall and was bailed out. 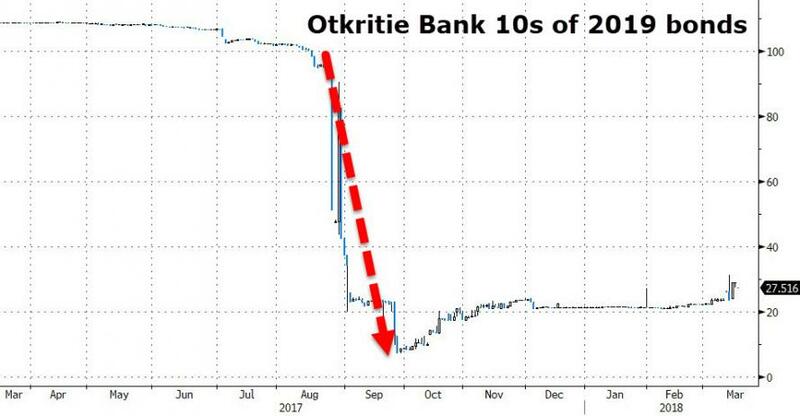 And now, five months later, Russia's central bank is mulling a further capital injection of a trillion rubles to rescue Otkritie and B&N Banks. 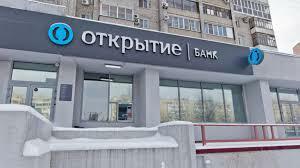 In August, Otkritie Bank, which according to Interfax, "ranks 1st among privately-owned banks and 4th by assets among banking groups in Russia," was rescued by the central bank because "the bank is a systemically important credit organization, it occupies the 8th place in terms of assets. The Bank's infrastructure includes 22 branches and more than 400 internal structural subdivisions." Interestingly, as the FT wrote at the start of 2017, "the breakneck expansion at Otkritie is raising fears that it is creating risks the state will eventually have to deal with. 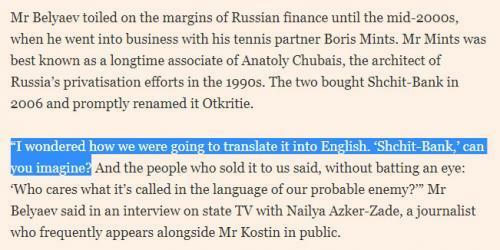 “It’s not a business, it’s all relations,” a senior Russian investor says. “They want to become too big to fail.” Adds a senior Russian banker: "They are not a bank, they are a very risky hedge fund. Why should this be done with regulators’ [the central bank’s] money?" And then, less than a month later, already nervous Russian depositors shifted their attention to another domestic lender, Russia’s B&N Bank, the country’s 12th biggest lender by assets, also sought a bailout from the central bank. B&N Bank, which is controlled by Russian oligarch Mikhail Gutseriev and was not on the central bank’s list of systemically important lenders, said it had under-estimated the problems within the banks it had bought during an expansion drive. 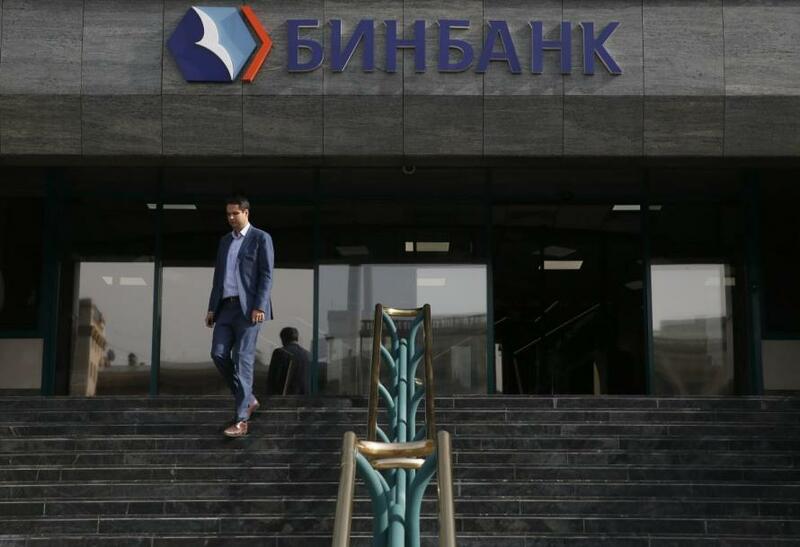 “Our objective is, with the support of the central bank ... to conduct an effective financial rehabilitation of the bank,” said Mikail Shishkhanov, who was named as chairman of B&N Bank, whose assets account for 2 percent of the Russian banking system, according to ratings agency Fitch. We noted at the time, that perhaps, if the Russian central bank has unlimited funds to keep bailing out the Russian oligarch's pet banks which they used mostly to launder illicit funds, then sure. Then again, where there are two bank runs in under a month, more are guaranteed, and all that would take to cripple the Russian financial system is a panic at one of the larger domestic banks, rekindling memories of the near collapse Russia experienced in late 2014 when crashing oil prices and a plunging ruble, sent Russian rates as high as 20% and pushed the country to the verge of hyperinflation. In other words, if the "deep state" really wants to hurt Russia, it knows what to do. 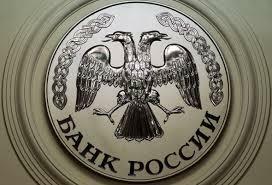 As Reuters reports, Russia's central bank is considering pumping more than 1 trillion roubles ($17 billion) into two banks it first bailed out last year to shore up their balance sheets, three sources familiar with the discussion told Reuters. The central bank bailed out private banks Otkritie, B&N Bank and Promsvyazbank in 2017 and shut dozens of smaller lenders as part of a broader clean-up of a sector weakened by mounting bad loans and deposit outflows. By the end of 2017, the central bank had provided more than 1.5 trillion roubles to improve the liquidity and capital of the three banks. Some of that money has been reimbursed but Otkritie has already said it needs more. The 1 trillion rouble capital injection now under discussion is for Otkritie's Trust and B&N's Rost subsidiaries and would come on top of the money already disbursed, a source close to one of the banks said. Notably, the governor of Russia's central bank, Elvira Nabiullina, is a close ally of President Vladimir Putin, who is on track to be re-elected in an election on Sunday... who presumably would like to avoid banking crisis headlines the day before the vote.